House Summons Fashola over Poor State of Roads, Bridges – Royal Times of Nigeria. 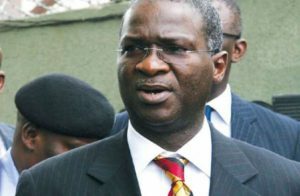 The Minister of Power, Works and Housing, Mr. Babatunde Fashola, has been invited to appear before the House of Representatives over failure of a contractor to reconstruct the Mararaba-Mubi-Michika-Madagali-Gwoza road and three bridges at Kudzum, Delchimi and Wurogyande broken by Boko Haram. A member representing Michika/Madagali federal constituency of Borno State, Hon. Adamu Kamale yesterday moved a motion which was adopted, telling the House about the plights of the people of the areas due to the bad state of the road. Kamale informed the House that a wooden makeshift bridge at Kudzum had broken down, consequently cutting Michika/Madagali constituency from the rest of the country. He noted that road users from Yola are now compelled to go through Mubi town and the bypass to access Michika/Madagali federal constituency, making journey along the route inconvenient. Kamale therefore prayed the House to direct the Committee on Works to invite Fashola to explain the state of the contract, particularly why the three broken bridges destroyed by Boko Haram insurgent have not been rehabilitated. The committee has been mandated to look into the circumstances leading to the award of the contract, the capacity of the contractor, mobilisation already made available and other information that that may necessitate the revocation and re-awarding of the contract for proper execution. The Federal Ministry of Works, Federal Roads Maintenance Agency (FERMA) and other government agencies saddled with the responsibility have been urged to ensure the immediate repair of the broken temporary bridges so Michika/Madagali federaI constituency can be linked to other parts of Nigeria.